Globally, studies concerning the Wellbeing of nations have gained much importance, because of the new approach they bring to the social science realm. They introduce the use of non-financial factors as a means of citizens evaluating their Wellbeing in view of governments’ service delivery. In developing countries however, Wellbeing continues to be a challenge because issues of human development have been given little attention than required. This can be solved by having a prosperous, healthy and skilled population that is able to handle the continent’s future challenges. 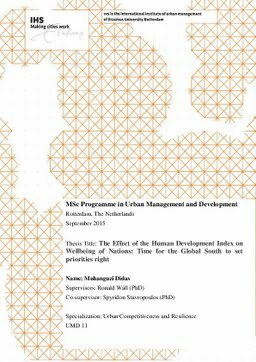 It is based on the above background that this study aimed at explaining the relationship between human development index and Wellbeing of citizens in developing countries. The major objective of this study was to contribute to the existing body of knowledge on Wellbeing and HDI globally but most importantly highlight its plight in developing economies. This was because despite there being many studies on Wellbeing, they have either concentrated on developed countries or dealt with how income, education and health separately or in a combination with other factors affect Wellbeing but literature on HDI and Wellbeing is very minimal. The study employed a survey strategy by reviewing secondary data collected by the World Bank, Gallup-Healthways, World Happiness Report 2015, UNESCO, WHO and UNDP; in addition to other several sources. Indicators for 8 years (2006-2013) were used. A total of 39 developing countries in the region were studied among three continents of Africa, Asia, and Latin America. This was based on the World Bank categorisation of these countries as developing economies, under low and lower income economies. Data was analysed using Excel, and STATA tools that modelled indicators using a linear random effects- regression to determine the significant relationship between HDI and Wellbeing. Both descriptive and explanatory methods were used to analyse, interpret and report results. This model was chosen because the data used was of panel in nature and included both time variant and invariant indicators. From the findings, it came out clearly and strongly that the relationship between HDI is strong and evident in developing countries. The findings revealed that there is a positive significant relationship between HDI and Wellbeing irrespective of the country size, income and population. Furthermore, the findings revealed that among the variables that make HDI, health and income contribute greatly towards influencing Wellbeing. However, other factors such as demography, location and governance also play an important role towards improving citizen’s Wellbeing. In view of the findings therefore, income, health, education, accessibility, governance, demography, and location are important factors countries should consider to transform society and attain a healthier, productive, and knowledgeable society. Although given peculiar differences between continents, this may not be generalised across the entire region but specific continental responsiveness to the model may be applied as explained in chapter four and five. Though this model can be generalised for the entire developing world, given the number of country observations per continent, it best suits Sub Saharan Africa.